Blake Hance (left) blocks for Justin Jackson. The rising junior is among the leaders on the Wildcats’ offensive line. Throughout last season, Northwestern coach Pat Fitzgerald was never shy about criticizing his offensive line when it was deserved. The Wildcats’ offense was unpredictable all season. 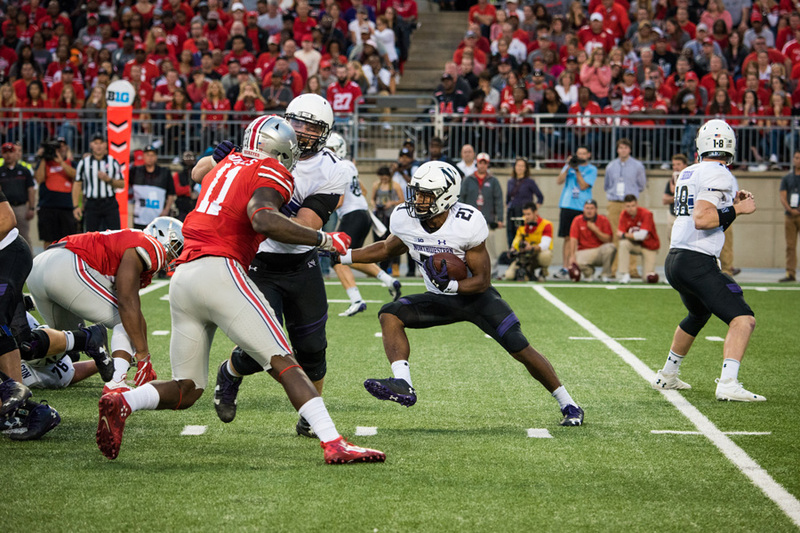 Led by blossoming quarterback Clayton Thorson, All-Big Ten runner Justin Jackson and receiver and Biletnikoff Award finalist Austin Carr, NU had the firepower to put big numbers on the scoreboard. It often didn’t, though, putting the players up front in the crosshairs. With Thorson and Jackson returning, the Cats again have the raw materials for a consistently productive offense — and again have questions to answer along the offensive line. Rising junior Tommy Doles looks to be the leader of the unit heading into next season. The charismatic lineman saw his first major action as an every-game starter last year, mostly at right guard, and earned an All-Big Ten honorable mention nod for his efforts. After that breakout season, Doles has stepped into a bigger leadership role among his linemates in the spring, his position coach said. Around Doles, NU brings several other familiar names into next season. Hance will likely hold down the left tackle spot he filled in 2016, while rising junior J.B. Butler and rising senior Brad North should see the field after ending the season as starters at left guard and center, respectively. Those players will be supplemented by a group of younger players who made a push for playing time in the spring practices. Cushing said freshman Gunnar Vogel and rising sophomore Andrew Otterman are in a “wide-open” competition for the starting right tackle job, and he mentioned being impressed by rising sophomore Jared Thomas in the spring as a reserve on the interior. For a unit that “didn’t have enough guys ready to go” last season, Cushing said, some semblance of depth is a welcome change. Doles said bringing the new faces up to speed was a focus of the spring practice period. Still, much of the group that frequently limited the Cats’ offense in 2016 is back, looking for redemption. And after a season full of criticism, their improvement figures to be a key to setting NU’s ceiling in 2017.